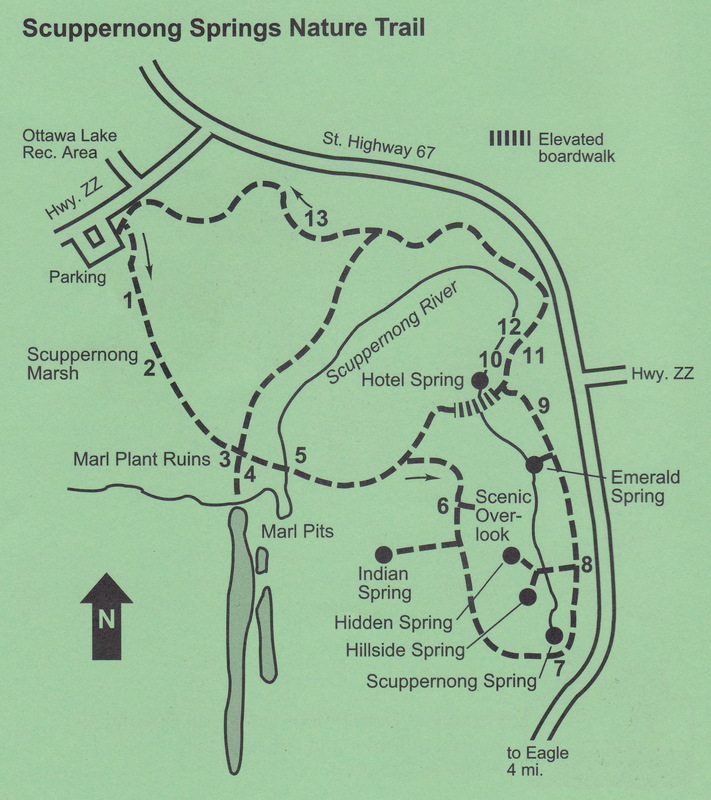 There is a wonderful Sand Prairie at the Indian Campground location along a crest on the Scuppernong Springs Nature Trail (see #6 Scenic Overlook on the map below). 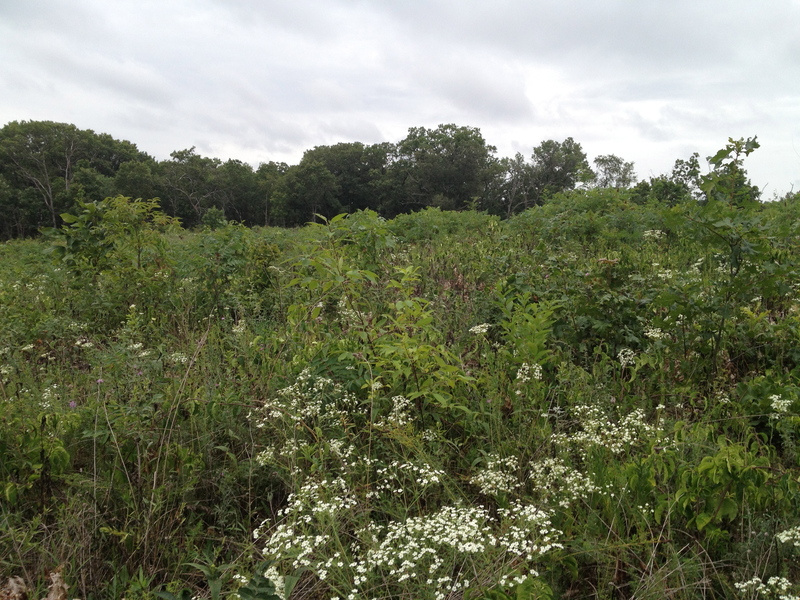 Some years ago the DNR burned and mowed this area in an attempt to beat back the encroachment of Red Oak, Cherry, Black Locust, Sumac, Hickory, Buckthorn and other woody plants that had begun to fill it in. 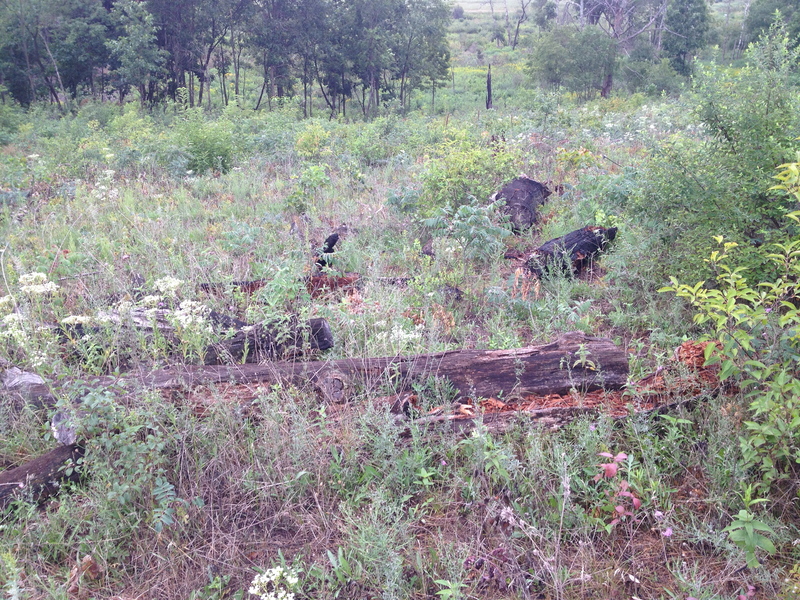 During the burn many large Red Oak and other trees came down. Their unburnt remains littered the Sand Prairie and would make it difficult to mow or burn the area again. 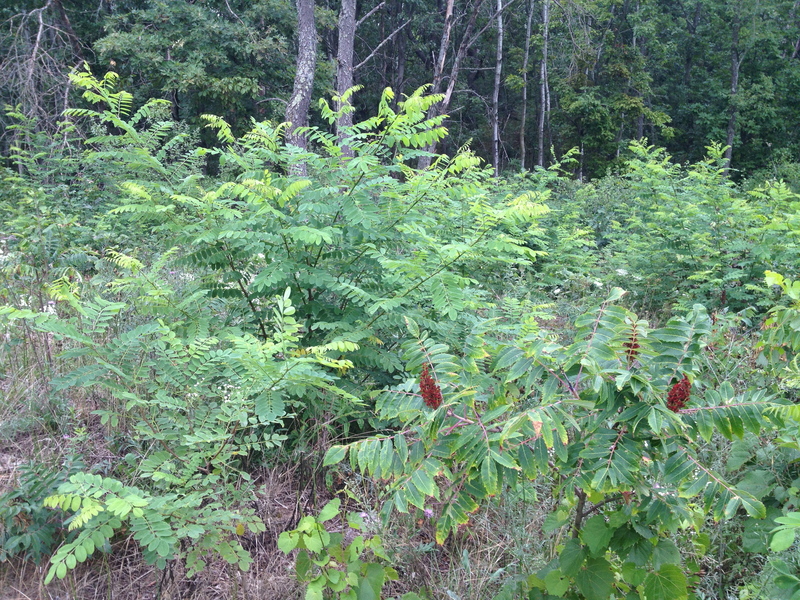 Many thousands of saplings from the parent trees had sprung back as well. 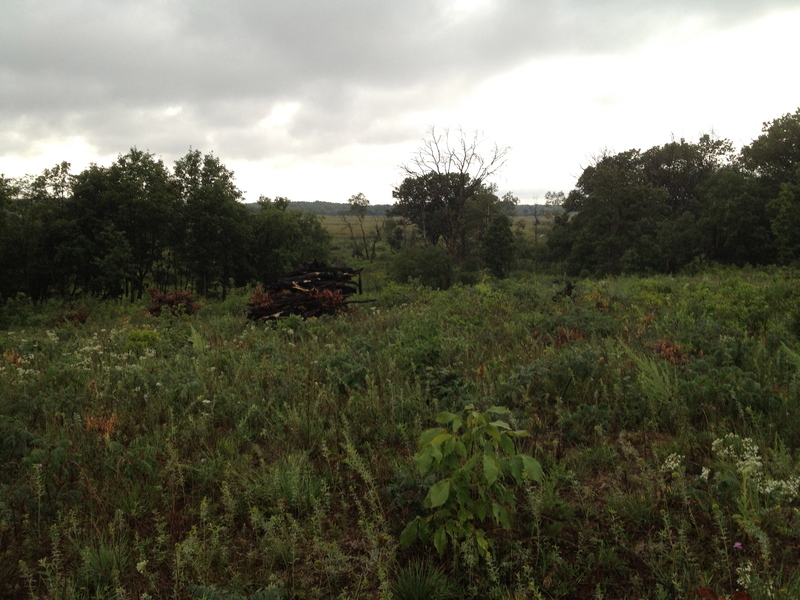 Ron Kurowski suggested we cut, pile and burn the downed wood to pave the way for Trail Boss Don Dane and his crew to mow the prairie again this Fall. We hope to burn it next Spring if the conditions are right. 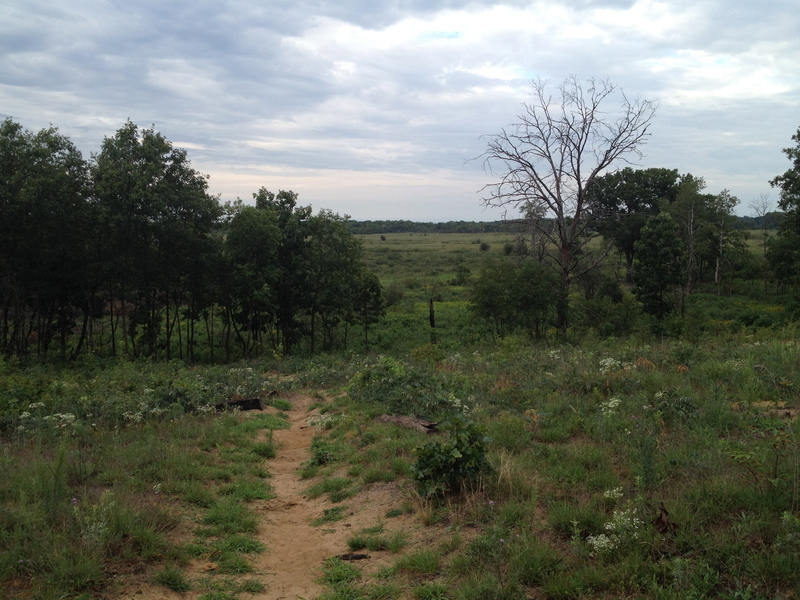 Here is a view from the scenic overlook looking West. 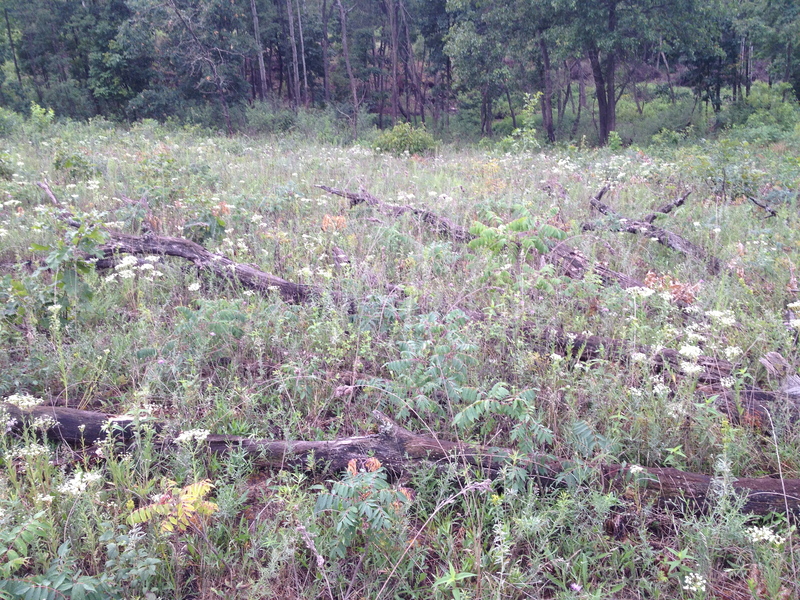 Examples of the woody plants making a comeback on the Sand Prairie. The short boardwalk below is at the Indian Springs. We discussed the best way to shore this up with Don and Dave and came up with a plan. Hopefully, we’ll get to this some time in October or November. Take another peek at the map shown above. 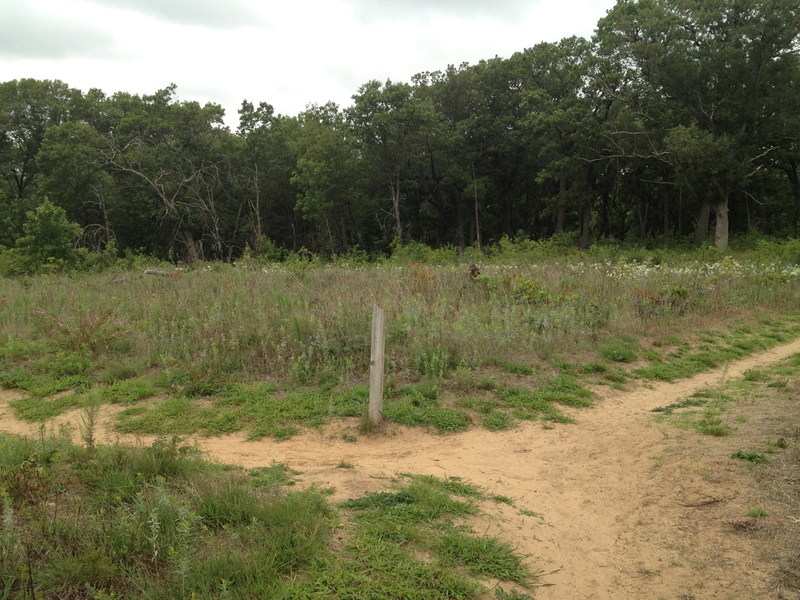 There is a trail shown that bisects the loop trail heading Northeast from #3 Marl Pit Ruins to join the main loop just to the right of the #13. 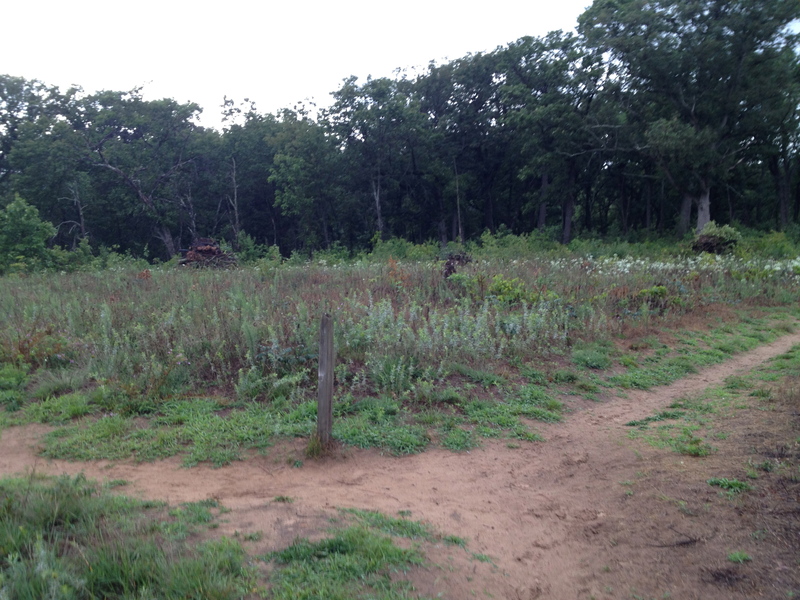 This trail has gotten so overgrown it is literally gone. When Ron took a tour with Lindsay and I a couple months ago, he pointed out the general area where this trail intersected the main trail in the vicinity of #13 on the map. We asked Don and Dave to help us relocate the path for this trail so we could open it up again and it didn’t take them long to find it. 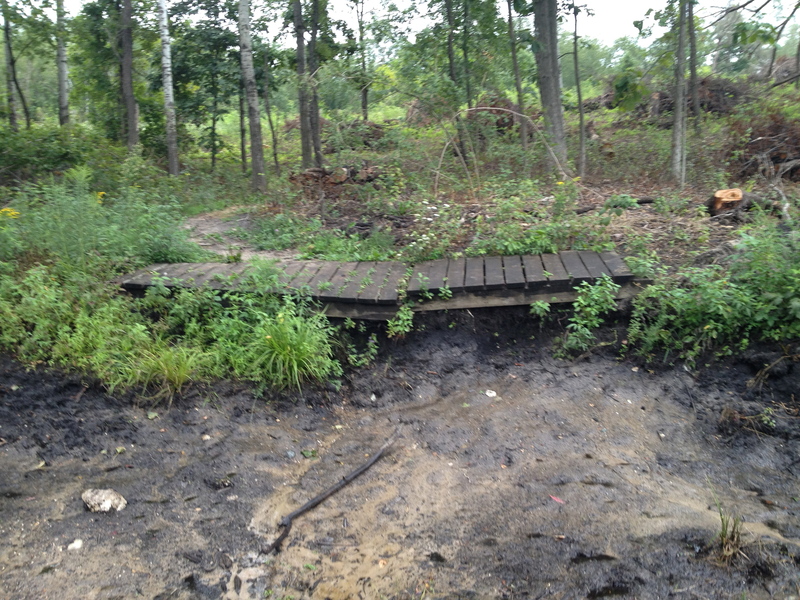 Don is planning to come back soon and flag the trail precisely and we hope to reopen this route sometime this Winter. It passes by some magnificent White Oaks, the biggest trees on the property. Needless to say, we are chomping at the bit to reveal these beauties. After Don and Dave left, Lindsay and I piled the wood I had cut in the morning at the Indian Campground. We enjoyed working in the rain for a change! 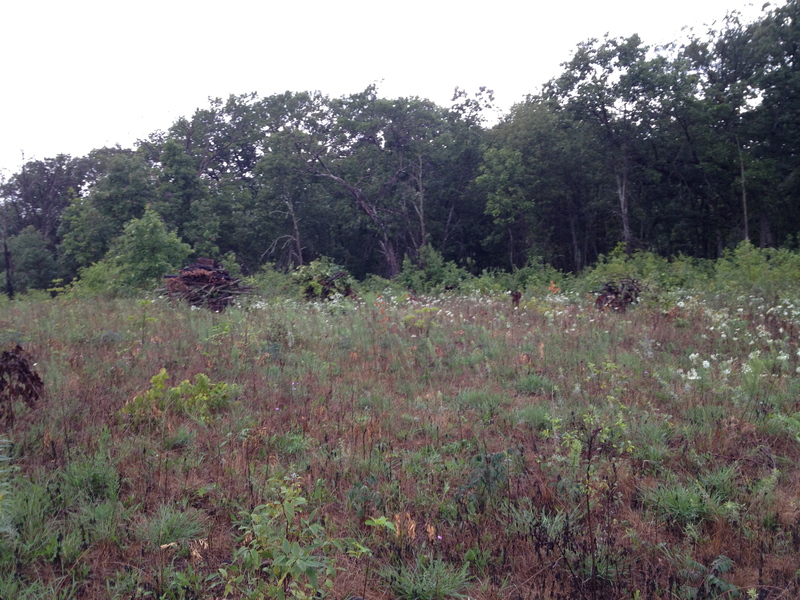 There is still a lot of prep work to do there before it will be ready for mowing and burning. This entry was posted in Brush Pile Burning, Indian Campground and tagged Indian Campground, Kettle Moraine State Forest, Kettle Moraine Trails, SouthEastern Wisconsin Hiking Trails by paulmozina. Bookmark the permalink. Looks great guys. I hope to get out there & help you stack brush before too long. I have been on this trail a few times recently and there NEVER was a hint of this newly discovered shortcut. So that’s a really good catch. Thank you for the information on the currently non-existent trail. I’ve always noticed it was listed on the map, but every since i’ve been coming to the trail as a child, i’ve never seen it. I can’t wait until that part is open. Also, will the trail run along the river, or stay further in the woods?